Home/Blog / Can Botox® Reduce Scarring? With the many diverse and significant therapeutic indications discovered for Botox® (migraine headaches, excessive sweating, eye muscle issues, bladder problems, etc.) in addition to its well-known usage in the treatment of facial wrinkles, it can literally be considered to be a miracle agent. Soon, researchers may just discover that it can also be an effective treatment for ED (erectile dysfunction) and opioid addiction as well as an important product to help obtain minimal scarring after surgery or injury. They already are seeing evidence that Botox® can help improve the appearance of scars? A few medical reports going back more than a decade ago have suggested, through direct evidence, that wounds treated with Botox® resulted in better scars than wounds that were not treated this way. Nevertheless, these were not large or scientifically rigorous studies. In the March 2018 issue of the Plastic and Reconstructive Surgery journal, the results of a small (14 patients) prospective, double-blind, randomized controlled trial (this all means that it followed proper scientific protocol and standards) conducted in China were published. 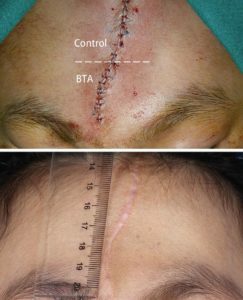 Without going into the gory details of the study, one half of the lengths of the wounds/incisions were treated with a standardized amount of Botox® while the other half treated with a placebo of same volume and appearance. At six months, the appearance of each half of the scars was then evaluated by a neutral party (who didn’t know which half was the Botox® treated one). The results, which did reach statistical significance, revealed that the Botox® treated half of the scars were generally narrower and less elevated than the placebo treated sections. The photo below shows one of the results obtained. Even with these positive results and others that have been reported in the past, we can’t state definitively that the usage of Botox® for acute wounds will lead to obtain less conspicuous scars. This will need to be studied far more extensively before any recommendations can be made if warranted by the data. The findings so far, however, have been quite intriguing. For more information about Botox®, scar treatment or any other plastic surgery procedure that you may be interested in, please contact our office.